This month's Pandora's Kharis cause is the crowdfunded restauration of the ancient theatre of Cassope, in the region of Epirus. It the latest cultural project to be crowdfunded under National Bank’s act4greece program. The target is set at 80,000 euros, and it must be reached by December 31. 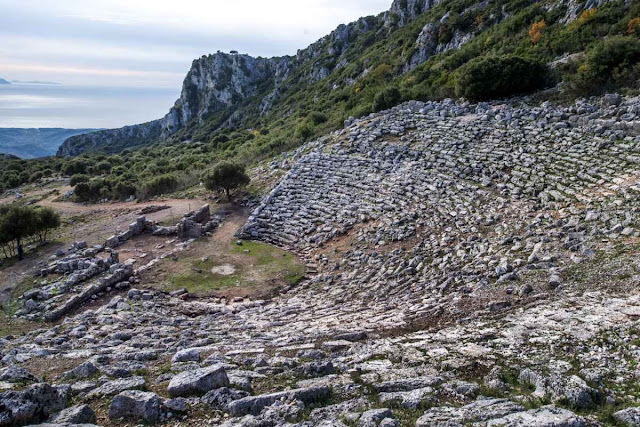 Diazoma, a citizens’ group that works to protect and promote Greece’s ancient monuments, recently came up with a proposal to include the Cassope theatre in the act4greece program – an idea that received the green light from National Bank. The Cassope campaign was officially launched on September 17 at the Little Theatre of Epidaurus, in the Peloponnese, where Diazoma was hosting its ninth annual conference. Participants discussed a wide range of ideas regarding how scientific and funding initiatives can put monuments into the service of regional growth. The ruins of the ancient city of Cassope, which flourished in the 3rd century BC, are located in a privileged position in the Preveza region, at the southern foot of Mount Zalongo, with a spectacular view of the Ionian Sea and the Ambracian Gulf. Cassope, Nicopolis, Ambracia, Dodoni and Gitanae are the main highlights on a cultural itinerary for Epirus designed by Diazoma. Funded by the Epirus Regional Authority, the cultural itinerary is part of an effort to improve the tourism product of the region and includes booklets, an e-tour of the itinerary with a relevant app, information signs, minor accessibility interventions and much more. The first project to be subsidized by the act4greece program was the Theatro Technis Karolos Koun. A total of 108,176 euros was raised. The deadline to donate is November 30th, 2016. You can do so by using the PayPal option to the side or by donating directly to baring.the.aegis@gmail.com. Thank you in advance!